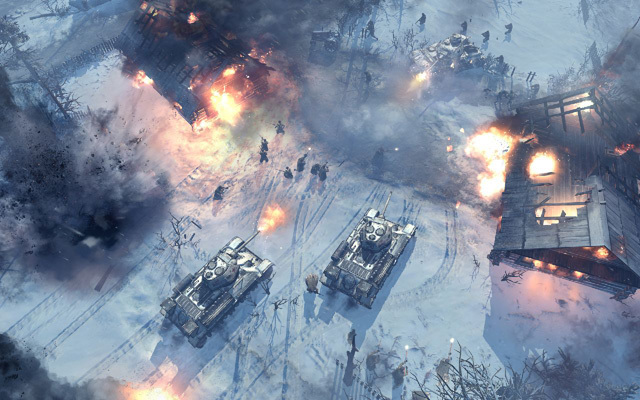 Not only is Company of Heroes 2 taking players to WWII’s brutal Eastern Front, but it is also hoping to bring fans as close to the action by focusing on realism. 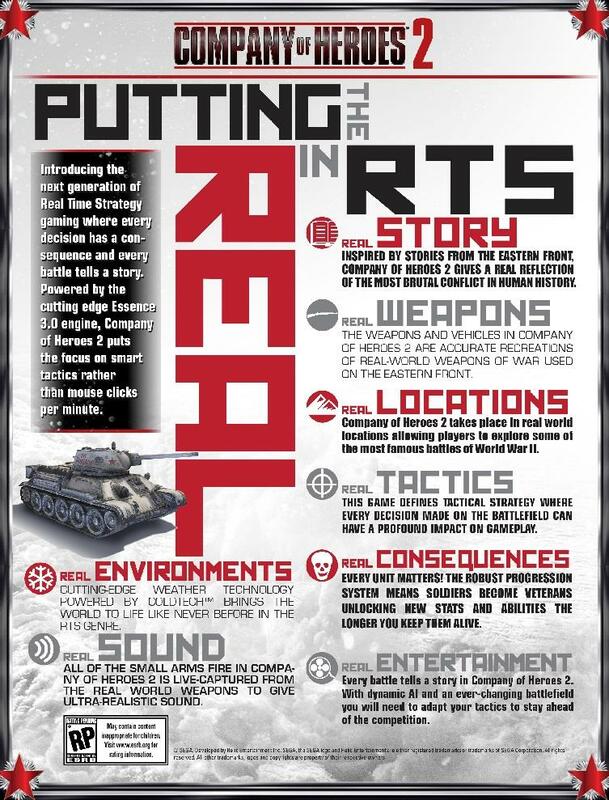 The best part of it all has to be the fact that Relic Entertainment has provided a nifty little infographic for your viewing pleasure. The image highlights the newest innovations making their way into Company of Heroes 2. Relic is going to great lengths in order to distance the game from its previous focus on actions-per minute and resource management. Yet, this is for the greater good and allows for CoH2 to become a game of real-time consequences. Did you think carefully, and quickly, about sending that fully leveled squad of soldiers across that frozen lake? Good, I mean you knew it was an ambush, right? True strategists will be able to foresee these dire consequences, and make decisions on the fly that secure the lives of their soldiers. This is critical once real-time weather dynamics force your soldiers to locate a source of heat, or face Mother Russia’s cruel winter, as blizzards sweep across the battlefield. Blizzards will even obstruct individual units’ line-of-sight, and will prove to be a key tactical advantage in warfare. The resourceful player will utilize the newly established cover to turn the tide of war. Gaining the ability to breathe for a moment provides what you need, an idea. Setting a row of buildings on fire adds to your coverage, while providing an invaluable source of heat that protects your soldiers from turning into popsicles. Unfortunately, buildings will deteriorate realistically to fire, and eventually, the wood will burn down into a pile of rubble. Yet, this is just a small sample of the realistic ways CoH2 is hoping to expand your experience. Relic is hoping to reward tactical players with a wide range of realistic improvements to the foundation of the award winning Company of Heroes franchise. Maintaining a high level of environmental awareness, keeping your wits about you, and making split-second decisions will all drastically impact your playing experience. Will you be able to lead your men to victory, as you face a constantly changing battlefield? Company of Heroes 2 is launching in North America and Europe on June 25th, so be sure to check back often for more on one of 2013’s most anticipated RTS titles.